Are you a hireling or a shepherd? Do you come at the first call to the vineyard or at the last hour? Have you let a field lay fallow once in a while? This last Monday night I was out tilling my gardens (yes, I have more than one…I know I have problems). While tilling I remembered some of the lessons Mrs. Phillips taught me and lessons learned from scripture. As I prepare to start planting, I find myself again reading scripture searching for knowledge from the Lord about getting a better harvest. Try it and see what you learn! I still recall my third birthday. At the time my family lived in Norfolk, Virginia. My Mom and Dad got me a Fisher-Price Kermit the Frog Hand Puppet (which I played with until I was about 15), some bubbles, and two plastic toy vehicles; a toy truck and a toy car. Having brother who was barely a year younger than myself meant that he too wanted to play with my new toys. It wasn’t more than 5 minutes after opening the car and truck that my little brother decided to yank the axles and wheels right off of both vehicles. I sat there on the linoleum floor looking at my brand new toys ripped to pieces only minutes after getting them. My brother, who to be fair was only 2, had broken the clips that held the axle in place on the toy car. The front axle of the truck had been bent. Neither vehicle was usable. I stared for a few moments. I didn’t cry or yell, I just looked. I grabbed the axle of the car which was the same width, and held it for a few moments. With some experimentation I replaced the broken front axle of the truck by using the smaller car axle. 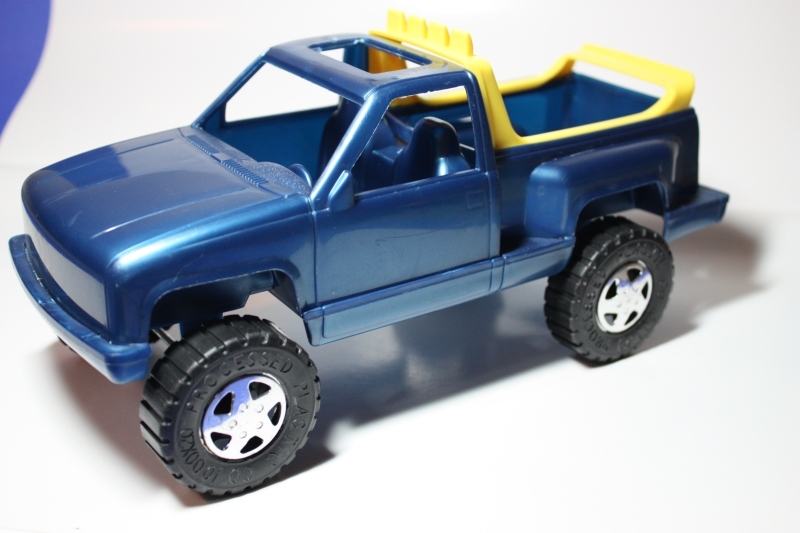 I now had a truck that looked cooler with it’s small front tires and big back tires, and it rolled across the floor better with the more smooth car tires. What once had been broken was now a much more fun toy truck. My brother and I played with that truck for quite a while; although I did have to remind him not to pull off the wheels. Some times we feel broken. We may not even understand why we feel that way. Although we may feel broken for the moment, God can fix us right up! Trust in Him, and he will direct your paths for good. I entered my local NPR station’s pledge drive mug art contest this year. 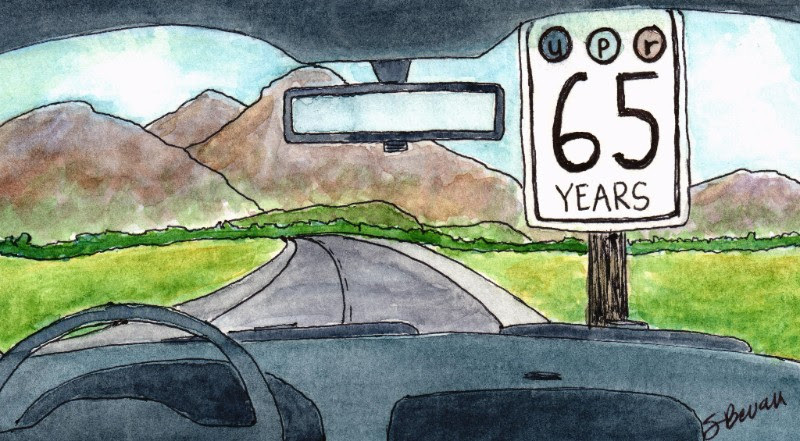 Doing just a loose watercolor sketch was a fun way to communicate their theme, celebrating 65 years on the air. 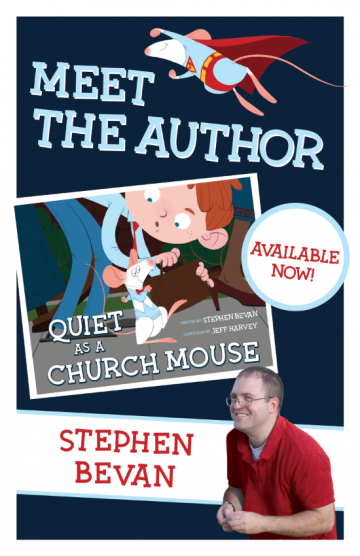 Congratulations to Stephen and his awesome design! Last year I was home from work for a day and not feeling well at all. My three year old daughter wanted to know if I would read to her. After about 8 books I really just needed some time to rest. So I hopped onto my video subscription website and went looking something for both of us to enjoy. 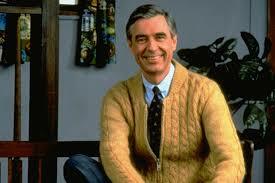 When I saw ‘Mister Rogers Neighborhood,’ in the list the choice was easy. I laid there on the couch with my daughter and tuned into the very first episode Fred Rogers aired. It was like a time machine taking me back to my own childhood. My three year old LOVED it, and asked to watch a second one, which we did. A few months later I found myself reading an article on Fred Rogers in the news. I found a book of some of his quotes. I was again feeling inspired to be a better person because of this simple man and his quiet ministry. These last few months have seemed turbulent. We can make the world a better place. We determine everyday through our actions what kind of a person we will become. As I mentioned in an earlier post the most important step we can take is our next step. Well neighbor, I hope we all choose to make our next step one of kindness. “A journey will have pain and failure. It is not only the steps forward that we must accept. It is the stumbles. The trials. The knowledge that we will fail. That we will hurt those around us. But if we stop, if we accept the person we are when we fall, the journey ends. The failure becomes our destination. There is something magical that happens when pen and paper meet. When it’s a story I am writing it is just fun to watch the characters develop and see what comes next. When it is a picture I am drawing there is the anticipation of how it will look in the end. If you haven’t used pen and paper to express something special to you in a while–I challenge you to try it. I challenge you to send a letter, write a thank you note, write a story, or draw a picture. See the magic of pen and paper. 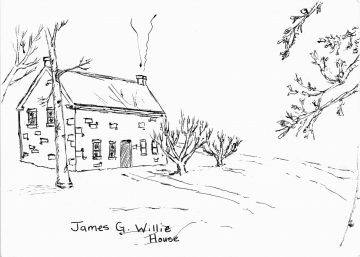 Here is the start of a drawing I began at work today of a historic house I have seen many times. The picture is nothing amazing but it was a magic way to spend 10 minutes. Nominate your favorite #LightTheWorld participants to win good books! Every year the LDS church encourages us to focus on Christ by lighting our world with good works. This year, authors at Cedar Fort and other presses would like to say thank you to those candles on the hill. 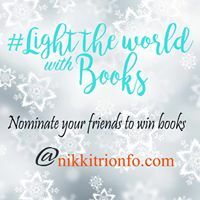 When you find a Facebook, Instagram or Twitter post that you think lights the world, please comment using the hashtag #LightTheWorldWithBooks. * Both YOU, the nominator, and YOUR FRIEND, the nominee, will automatically be entered to win one of 25 books, mailed right to the doorstep. For official rules and details on the prize books, visit nikkitrionfo.com. When the weather starts to cool it seems there is just a natural tendency for me to break out my wood working tools. Something about Christmas time makes me want to build something for those I love. It has been this way since I was 12 years old. I remember that Christmas very well. All around me others were eagerly writing wish lists for Christmas of very expensive toys and gadgets. I was right in there with them! We were looking at glossy catalogs and cool stuff and each night my dreams were filled with new toys. It’s hard not to get caught up in the hustle and bustle. One Sunday a talk in church caused me to stop and look at my own behavior; I felt guilty and ashamed for my own greed and avarice. My first response is something I can’t say I am proud of—I made a colorful sign to hang in my window. It was my own protest to the commercialism of the season. The sign in fancy lettering read, “Bah Humbug.” My siblings teased me and called me, “Mr. Scrooge.” It wasn’t Christmas I was protesting with my sign, but rather the greed that had consumed me personally. What brought me out of it was making a gift with my own two hands for someone else. This time of year I often break out my tools to make a gift or two. Something about the process of making a gift always brings me back to the meaning of it all. Somehow it helps me put everything back into focus and put Christ right in the forefront of Christmas where he belongs. Perhaps it helps me because Jesus was a carpenter. Perhaps it’s simply the art of creation that reminds me of the creator of all things. Last night my son came and told me of a gift he wanted to make for his sisters. It would involve saws, nails, hammers etc. It was the perfect way to get me back on track this season. I am grateful for the chance to get back in touch with the master creator and make something for Christmas. 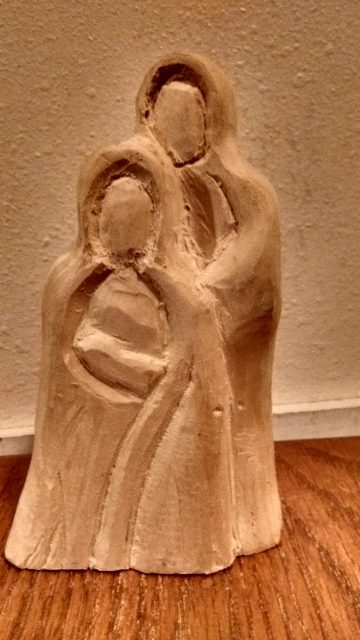 Feeling lost or frustrated this Christmas season….maybe you should try making a gift for someone you love? 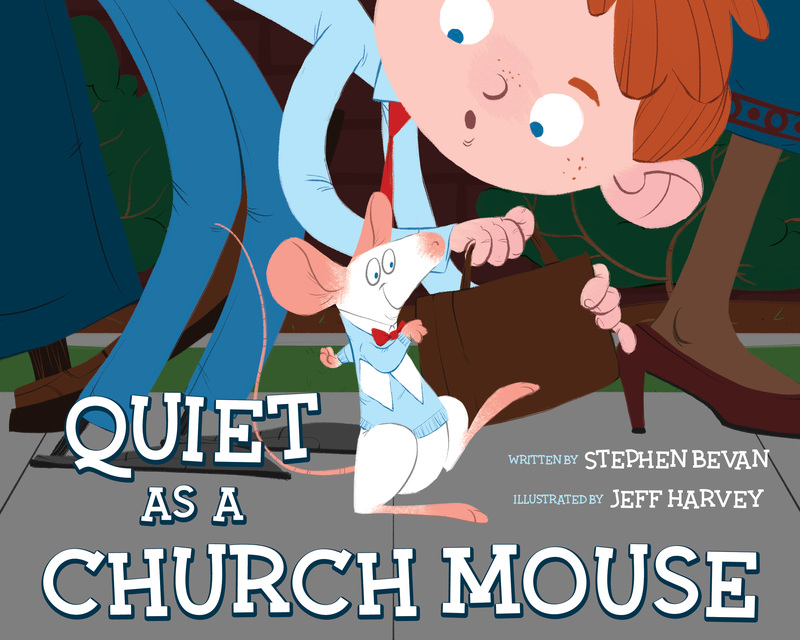 I am excited to announce that my new book, “Quiet as a Church Mouse,” is officially out today! You can find my book through my publisher Cedar Fort, or through Deseret Book, Amazon, and Barnes and Noble. In addition we have three great events for this upcoming Saturday November 18th, 2017. At 10:00 AM I will start the day at the Mendon City Library. There will be live music, stories, art/drawing, and a Q&A opportunity. At 1:00 PM we will be at the Hyrum City Library for a similar event. Then at 4:00 PM we will have a party at The Book Table in Logan, Utah. If you are in the area I hope to see you at one of these events. If you won’t be able to make it to these events there are more coming-so hopefully we can see you next time. 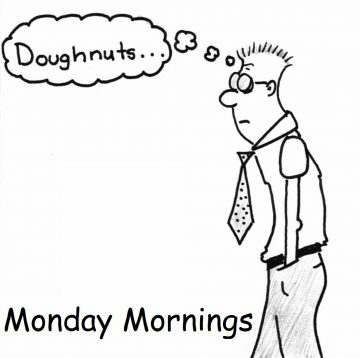 Like most people–Monday means it’s time to get back to work. Camping trips with the scouts are done. 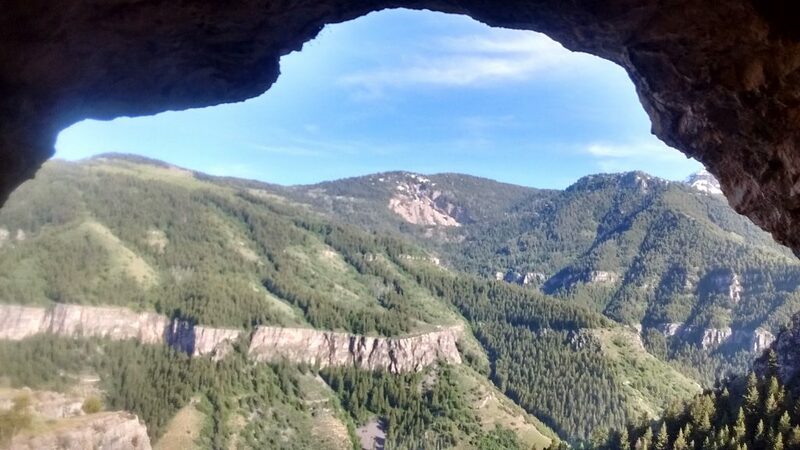 Hikes with the family are now pictures and fun memories. Walks with the dog get a little shorter. And the daily grind begins. This morning, on a short break, I couldn’t help but make a little doodle about how I felt this morning. I hope it makes your Monday a little better.